One can be forgiven for forgetting the Toyota Avalon exists. It’s pretty far from an enthusiast vehicle, the market’s currently hostile to big sedans, and it could be argued the Toyota brand hasn’t had any cool large four-doors in the U.S. since the Cressida packed a straight six and rear-wheel drive. But the Avalon is a thing, and it’s all-new and back for 2019. Let us gather now and behold it. A year after the new Toyota Camry dropped here at the Detroit Auto Show, we have its somewhat more upscale and expensive big brother. As it’s based on the new Camry’s architecture, it’s front-wheel drive and offers the same 301 horsepower 3.5-liter V6 or the choice of a 203 horsepower hybrid 2.5-liter four-cylinder. An eight-speed automatic is the sole gearbox option. 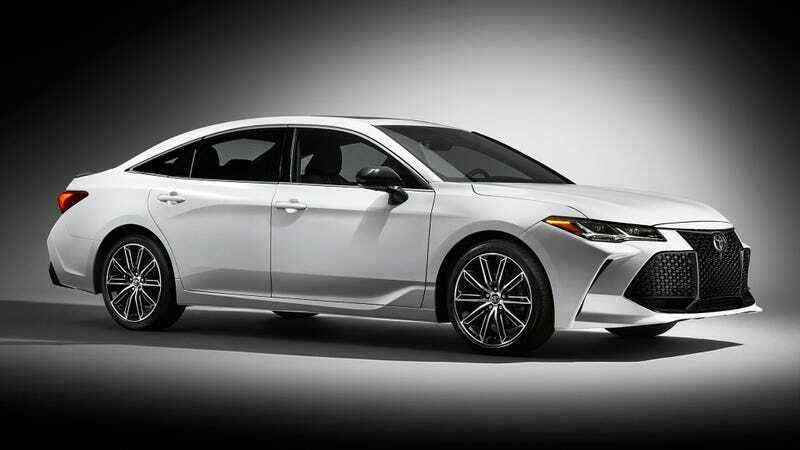 Toyota, in a news release, vows that the new Avalon offers more “hustle, athleticism, and fuel-efficiency.” We’ll see about the first two, but new tweaks include a suspension with adaptive dampers, a far more premium-looking interior with a seven-inch screen, Apple CarPlay, a very good optional JBL performance audio system and other amenities the dedicated Avalon buyer simply would not be able to live without. Pricing has not been announced. I’m excited. Can you tell I’m excited?